EM01 bottom left. L02 top right with cloth for micarta. 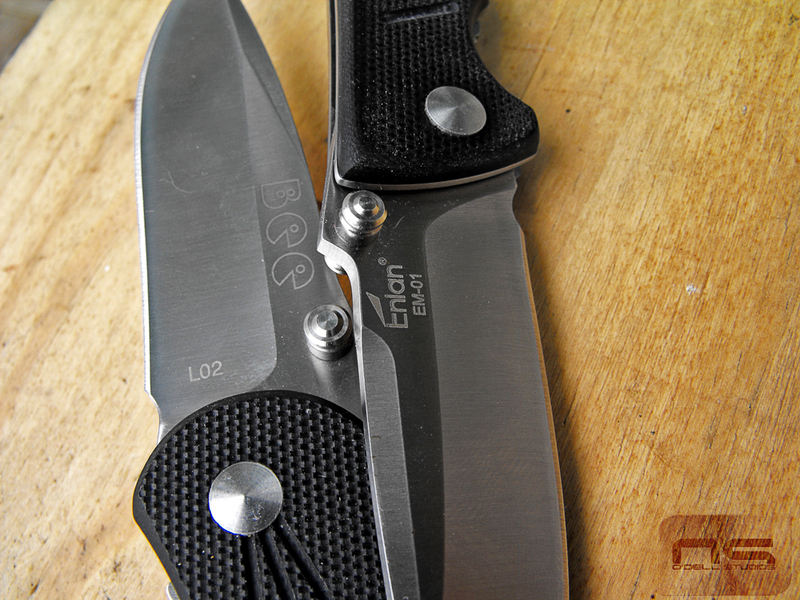 Mailman brought me a couple more knives last week; an Enlan L02 and EM01. Not sure the story but the L02 says "BEE" in the cheesiest Pac-Man letters they could find but the seller mentioned this in the posting I think. I don't know how they get it done but they are getting to me from someplace in China in 8 or 9 days which is remarkable I think. 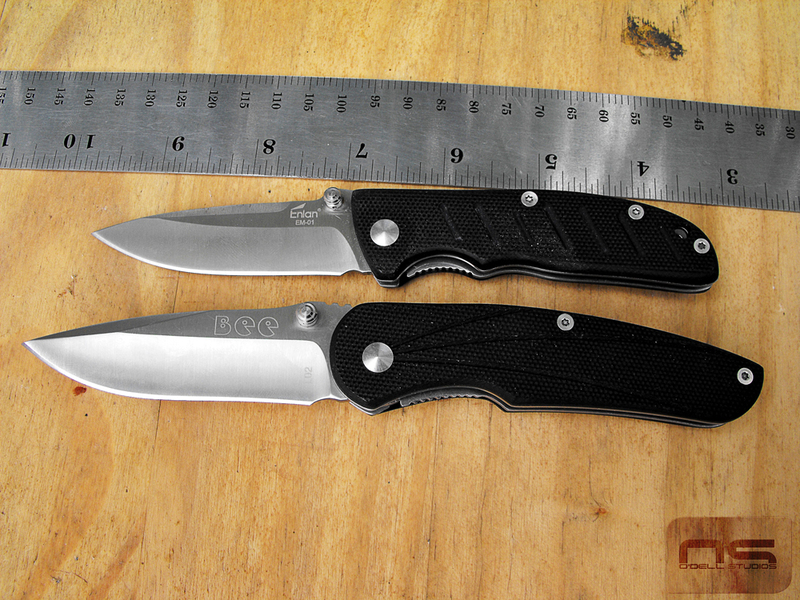 When you spend so little on halfway decent knives I think it's fair to expect some quality control issues and I imagine that is the area they skimp on the most to hit the price point. I've now handled 4 different models and they all had different issues. 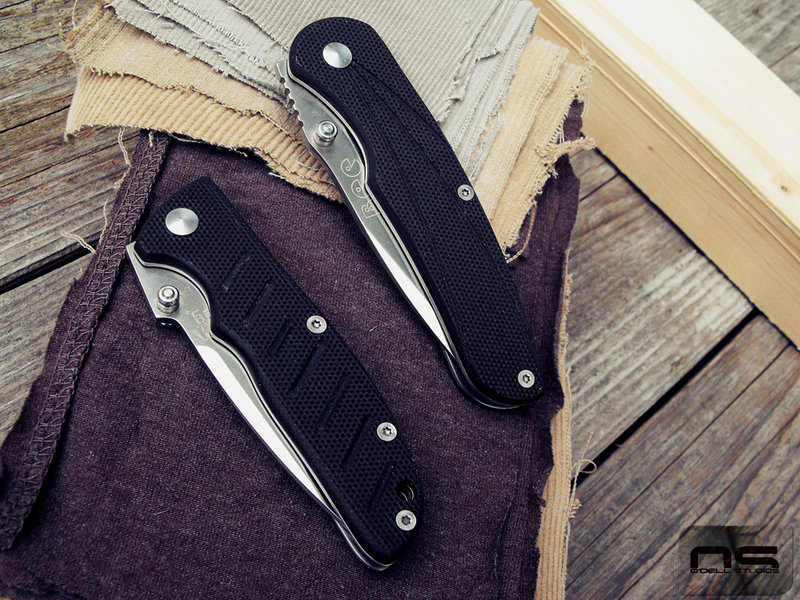 It's hard to imagine how many different people are assembling and finishing Enlan's knives but none of these problems are so significant they can't be fixed. For the most part they are stiff and a little gritty opening and on both of these examples there are some errant grinding marks. I am also annoyed that they don't take the time to make them look as good closed as they do open and unfortunately there is very little extra material to work with to improve them. On the L02 it looked like they super glued all the screws in place. It was like one day they ran out of thread locker and said, "Just hand me the super glue. Works fine!" Uh, yeah it works, unless you want to take them apart. In the end I didn't really beat it up too badly getting it apart and brake fluid will dissolve just about anything. Working on the assumption that the EM01 might have the same issue I just doused it with brake fluid and left it to sit while I worked on the L02. Turns out that it didn't have the same problem, so you just never know what you're going to get. Other than that though, nothing really to complain about for the money spent. Not sure what you were supposed to see in this picture. These pictures are all straight out of the box. You can see here on the spine on the right there is some uneven grinding. That'll need fixed. Some blade detail. Luckily they do a nice job of grinding the blades. Sometimes the edges aren't perfectly centered but both of these came plenty sharp and overall good enough. Here are some of those wild grinds. On the EM01 there is that little bevel where the rest of the blade is square and this feature doesn't appear on the other side. Nothing I can really do about it unless I want to round the whole spine - and I don't. On the lower right I am going to knock as much of that corner off as possible so that one is fixable. You might also notice on the EM01 there is some rust in the etching. For size comparison the L02 is more their medium sized line. 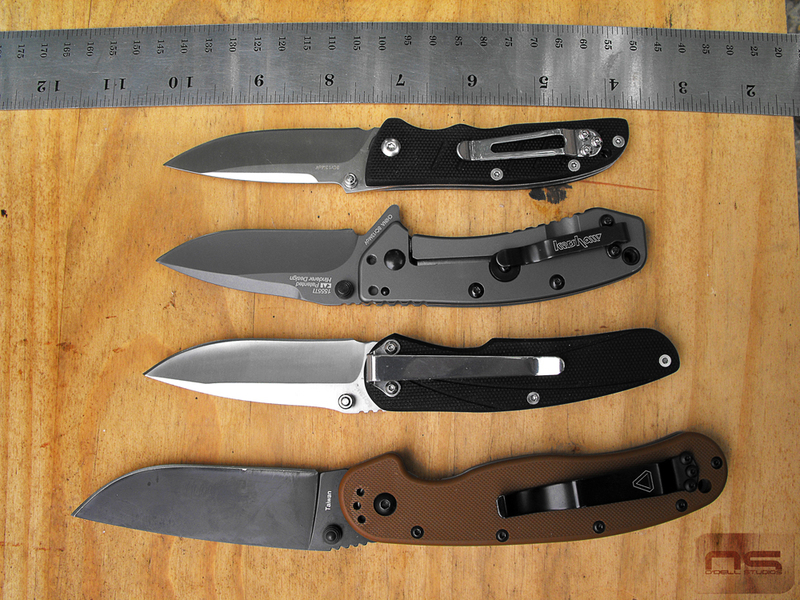 All the other knives I've done are like the EM01 on the far right. They are pretty small but really a nice size for EDC use. With that said, even the medium sized L02 is not huge. 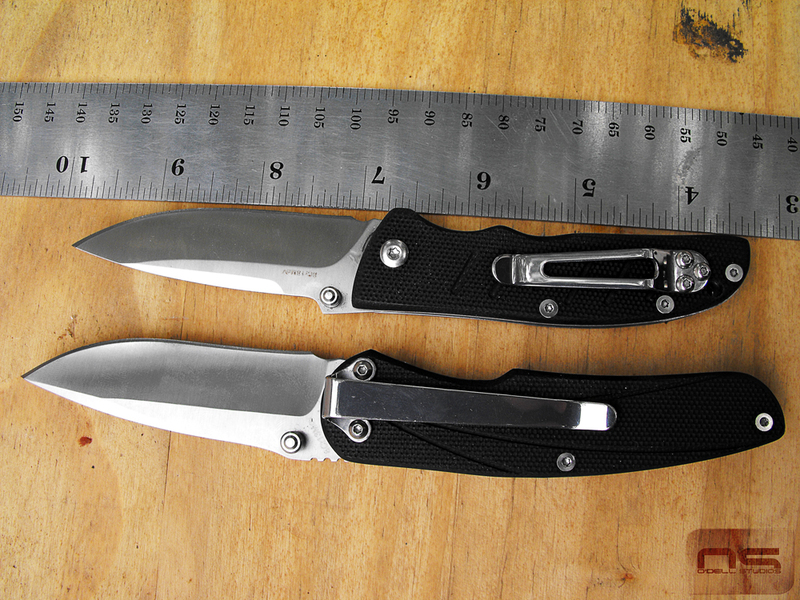 The L02 steps up in size but overall isn't a big knife. I would consider the Cryo to be smallish and the L02 isn't much longer. It's not until we get into RAT 1 dimensions that I consider a knife too big for EDC use personally. This gives a better idea of the size difference together but you'll see later that you go up in size only slightly but get a lot more material. 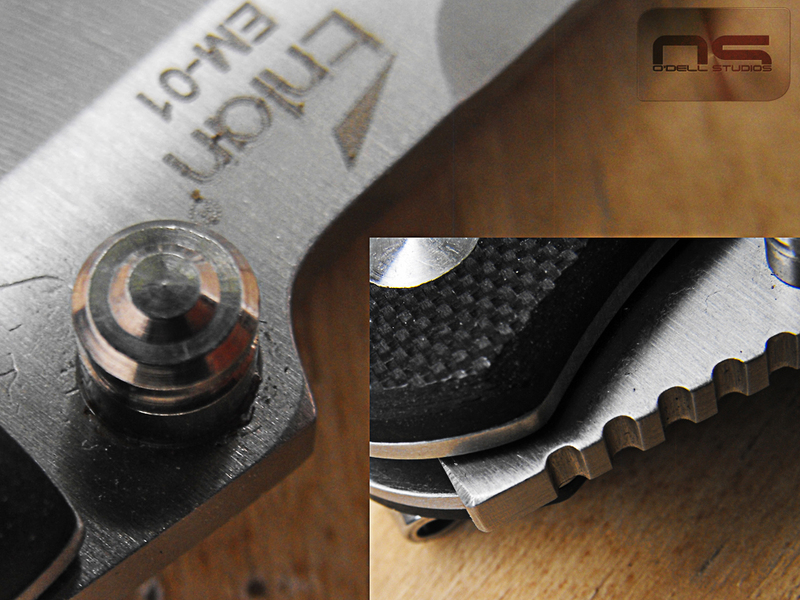 I like the L02 pocket clip ok but the positioning is weird and the pivot screw is under it. Slight oversight. I'll be putting the screw on the other side of course. It's interesting that the EM01 gets 3 pillars. I could probably save one for another project but I guess that makes it just that much tougher. 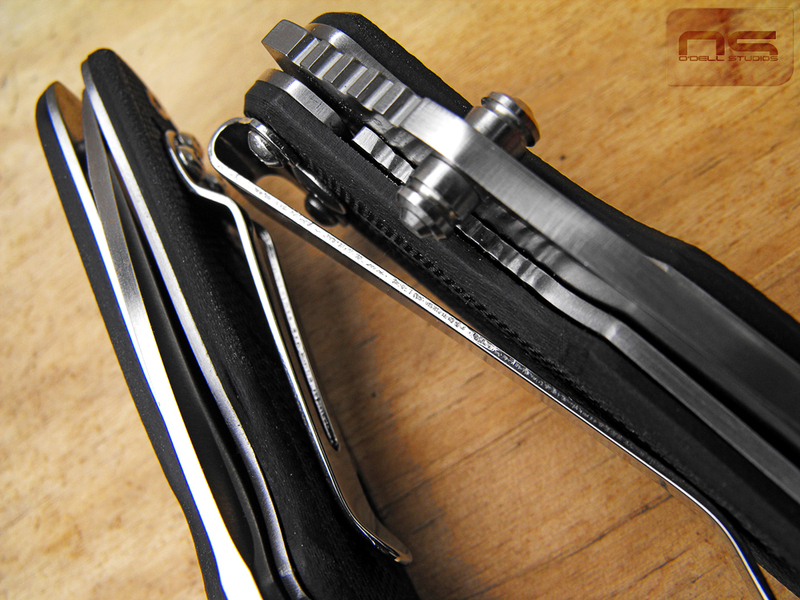 Its pocket clip looks good but with the rough texture on the scales, it is a pocket eater. There is that silly BEE logo. I was able to mostly sand it off. The thumb studs screw together but I have no good way to get them apart and back together other than pliers. Curiosity got the best of me and I removed them from the L02 but put a mark or two in it in the process. Oh well. Not being able to remove the thumb stud kind of limits what I can do with the blade. 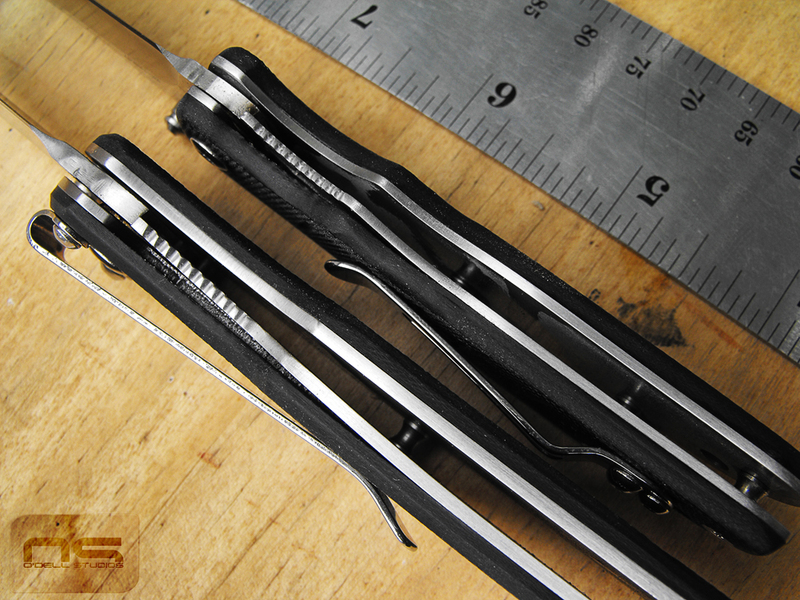 OK here you can see that when you step up in size, you get thicker liners, blade and even thumb studs. Also note that these two knives came with hourglass pillars which is kinda fancy pants. Lock up looks good and is a bit early on both - works for me. Here you can clearly see the larger thumb stud and thicker steel, though you don't get a heavier stop pin. This particular L02 functions pretty nicely as well. The detent feels crisp and it actually sounds a lot like my RAT Model 1 when you snap it open - it has that positive pop as it locks. The EM01 is a little rough with a sticky lock - nothing a little tweaking can't overcome. 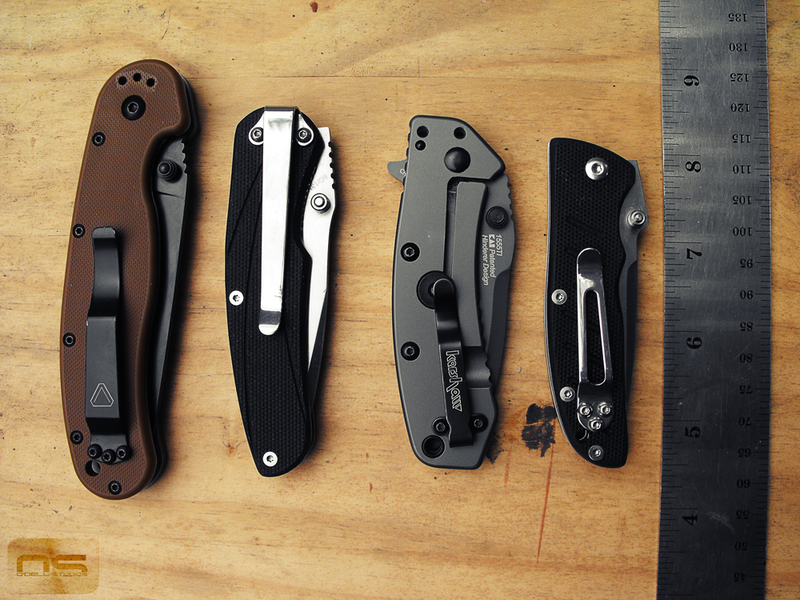 It's worth noting that none of these knives have been especially good feeling right out of the box. I think they are left dirty and assembled hastily. This isn't a bad thing necessarily but it isn't something that's going to really wear in any time soon. The tolerances are good so it takes very little effort to get nice smooth functioning knives if you take them apart and work a few surfaces. I polish the bronze (I hear them called phosphor bronze - must be right) washer and that alone makes a huge difference. They have all been rough so far. A good cleaning corrects a huge portion of the rest of the feel and a touch of grease just about does it. I go a little further by putting a smooth spot on the pivot and polishing the surfaces around the pivot on the blade as well as the liners. So far this has resulted in glassy smooth function for a knife using a bronze and nylon washer as bushings. 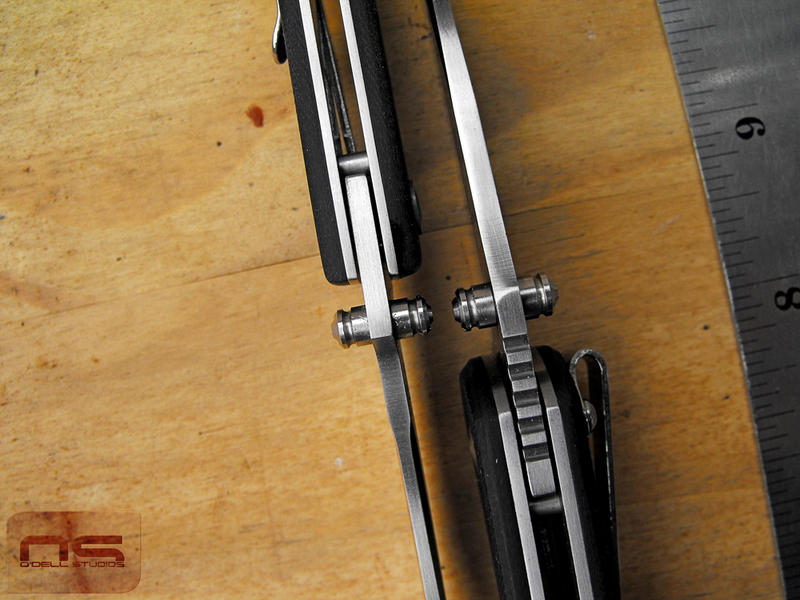 Bearings feel great and really are nice, but you can do a lot with this simple system.